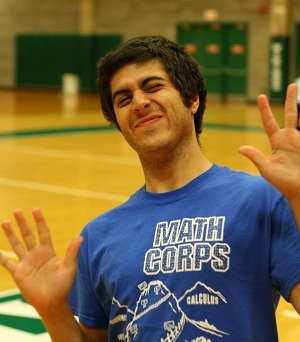 What Is the Math Corps? The Math Corps Cleveland is a combined academic enrichment and mentoring program that brings middle and high school students from the greater Cleveland area together, with college students, to learn mathematics from each other, as well as to interact with professional mathematicians in a university setting. We are a branch of the Wayne State University Math Corps, seeking to replicate the tremendous successes of the model they have developed over the course of 20+ years. The Math Corps is based on the dream of creating a self-perpetuating corps of students from middle school through college, who excel academically, hold values that breed success in general, and who, through strong mentoring relationships, pass their knowledge and their values on to younger students, who in turn do the same. In a world where the dreams of children are so often unfulfilled or not even encouraged, and where the obstacles to success are so daunting, the Math Corps has, from the beginning, been about making a difference and changing lives. At its core, the Math Corps is about a very simple but unwavering belief that all children have a unique and special greatness within them, and that through hard work and a commitment to excellence, as well as with the support of a caring community, this greatness can be realized. 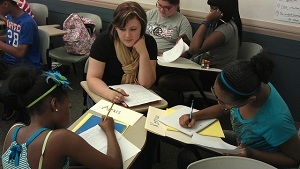 The Math Corps Summer Camp, the centerpiece of the Math Corps, is a six-week program on Cleveland State's campus. 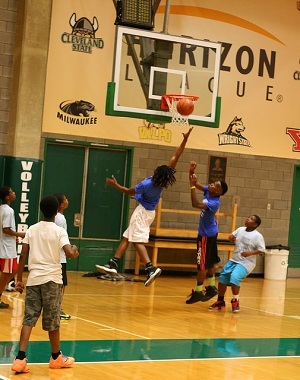 The program serves cohorts of seventh- and eighth-graders, as well as a group of high school students. College students serve as instructors and mentors. The students are broken into teams, with each team having 10 middle school students, 5 high school students (TAs) and 1 college student (CI) at the head. Each day of the camp has a morning and an afternoon component. In the morning, the focus is entirely on the middle school kids. The CI's and TA's not only serve as teachers and role models, but in many instances, as essentially "big brothers" and "big sisters". In the afternoon, the middle school students participate in a variety of hands-on activities, while the high school students engage in two mathematics courses of their own, at least one of which is an advanced course at the college level. Before the Bell: While each day officially begins at 9:30 am, our doors open at 8:30 am. 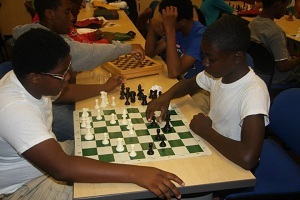 Students are warmly greeted, provided with a light breakfast and can participate in any number of optional activities, including playing games such as chess and mancala, going over homework or just plain socializing. The high school teaching assistants (TAâ€™s) meet at 9:00 am with their college instructors (CIâ€™s) to plan out their teamâ€™s day. Assembly: A half-hour assembly formally begins the day, with â€œRoll Callâ€� promptly at 9:30 am. Assembly serves to create an environment in which academic achievement is celebrated and learning is seen to be fun. Everyday, student accomplishments such as perfect homework scores are publicly recognized, with the majority of students being acknowledged on most days and no student going very long without recognition. Comical skits, musical performances, storytelling and anything else that our students might find entertaining are all routine parts of what happens in assembly. Team Time: "Team Time," which follows the assembly, is one hour in duration and is conducted purely under the leadership of the college and high school students. Each team consists of 10 middle school students, led by a college student instructor (CI) and five high school teaching assistants (TAâ€™s). "Team Time" begins with the TAâ€™s reviewing the basics with their middle school students (each TA typically works with 2 middle school students) and in particular, going over the homework due that day. A variety of activities including work on advanced topics, group problem-solving and mathematical games fill out the remainder of the hour. Above all, "team time" is designed to promote a bonding among students, wherein big brother/big sister relationships among younger and older students are fostered and flourish. Courses and Curriculum: Every student in the Math Corps receives formal instruction in both basic Mathematics and in advanced topics. Click here for more information about our curriculum. Lunch/Family Meal Day: Students are required to bring a lunch or money for lunch every day except Thursday. They have the opportunity to eat at the various campus restaurants and get a feel for what itâ€™s like to be on a college campus. Thursday is "Family Meal Day" and everyone eats together (usually outdoors) with a fun free lunch (pizza, hamburgers, etc.) provided by the program. Students and staff get to hang out and simply enjoy a relaxing time together. Itâ€™s not unusual for impromptu dance sessions or football games to break out. Afternoon Activities: Each day Math Corps participants engage in STEM-related activities (Science, Technology, Engineering, Mathematics), in addition to their math classes. These hands-on experiences expose students to real-world applications of mathematics as well as potential career opportunities. Past activities have included: chess, robotics, cryptography and modular arithmetic. Closing Ceremony: The Summer Programs end on a Friday night with the Math Corpsâ€™ Closing Ceremony. The event is a celebration of both student achievement and the building of a "family." Student work completed during the summer is displayed, academic presentations are given in groups by both middle and high school students and awards are presented to acknowledge outstanding student achievement. Then, in keeping with the Math Corpsâ€™ philosophy, awards are given for dedication, commitment and hard work. The Super Saturday Program is another emblematic part of the Math Corps- one that serves as a complement to the summer camp and keeps our family connected during the school year. In addition to participating in grade-level and advanced studies in Mathematics, the students receive preliminary training designed to prepare them to fill the role of high school Teaching Assistant for the Math Corps Summer Programs. The Super Saturday Program is free of charge for all students. TAs participate as volunteers and receive a problem-solving workshop that prepares them to maximize their performance on the Mathematics portion of the ACT college placement exam. While priority is given to former summer camp participants, we welcome new members of the family.